Rounds took a while today. We have quite a few patients. Several had big dressings to change. Two of the wound vacs needed changing also. Our diabetic patient’s amputation stump incision looks good but unfortunately his blood sugar is very high. We had to get the doctor working in the ER to evaluate him and make recommendations. Nathan and ZJ were out in the storage area working on cutting some wood to make shelves so I helped them for a couple of hours. Later in the afternoon, we took the man with the pelvic injury to the OR. I gave him some sedation and put in a distal femoral traction pin with local anesthesia. I used the C-arm to see if his displaced hemipelvis would reduce. It did come down to the right level but the S-I joint was still widened. It definitely needs a screw or two to get it together. I will need good anesthesia for that so will probably need to wait a week. After I finished and was starting to move the patient to the gurney, his oxygen saturation dropped significantly. We put him on oxygen which didn’t seem to help. We finally decided to put him on heparin. He improved a lot in less than an hour. I wish I had consultants available to help with these complicating problems. Fortunately, he stabilized and seems pretty normal. ZJ, Lynne and Mark helped monitor him through the night. The clinic today wasn’t nearly as big as the clinics last week. I saw several more patients for John Henrzenberg today including a 20 y/o with severe spastic club foot and knee flexion spasticity. I think he can be improved a lot with surgery. Dr Stutz of the Lovejoy team did a major procedure on his spastic upper extremity. I put him in a preliminary stretching cast. Our 12 y/o girl with the comminuted femur fracture suddenly had a lot of pain in the therapy department. Her external fixator had come loose so we admitted her. We will only have anesthesia for a few hours tomorrow. I hope we can get all of the casts changed and pins removed on the clubfoot patients and still have time to get her ex-fix back on. I still have the man with the hip fracture that needs a hemiarthroplasty. Maybe I can do him on Thursday if we have anesthesia long enough. The anesthesiologist came today between 8:30 and 9 am and told us she had to leave by 11. We hustled and used all three rooms and were able to get 5 cases done including replacing the ex-fix and reducing the fractured femur on the 12 y/o. The anesthesiologist really did a good job. She had some of the OR nurses monitoring the patients as we changed casts, removed pins and did manipulations. We then had 3 cases using local anesthesia. It turned out to be a very productive day. We only had to cancel the patient for clubfoot correction. We finished all of the cases in time for JJ and I to throw the football for a while. We had fun. He is a very good natural athlete. Tomorrow is Flag Day here in Haiti and the clinic might be smaller. If so, I’ll try to get all of the translators to get their Packers tee shirts and we’ll try to have a little scrimmage. Wed clinic went until after 7 pm. I saw 12 new peds patients with operative conditions and put them on Herzenberg’s schedule. I sent John 2 emails with pictures of patients and xrays. His response to the first email was “yikes.” To the second email was “double yikes.” The attached hand xray is of a 12 y/o boy with an “earthquake” injury. The most impressive cases were an entire family with severe genu valgum. The mother has combined 75 degrees valgus. The 14 y/o daughter has combined 115 Degrees and the 13y/o daughter has combined 125 degrees. They walk with marked hip flexion presumably to take some of the stress off the ankles looking rather like crabs. Pat did the patient with the tibial plateau malunion. It wound up looking really good on the C-arm. That will be a real win for the patient. He is a mason and really wants to return to work. We had twelve cases scheduled. Several were smaller cases of post op cast changes and manipulations and debridements. We started the first two at 7 am and finished the last one at 9 pm. Pat did an arthrodesis of Subtalar and talonavicular joints and was very pleased how it went. Together we did a case of chronic osteomyelitis in a femur fracture. It is a case that the Yoon team had cared for when they were here in November last year. We found at least two sequestrums and did an exchanged antibiotic SIGN nail rodding. We have been able to get quite a few cases done that have been pending. The Yoon team is really great to work with. The Yoon team went to an orphanage today. It is the same one they went to the last time they were here. Jeannie said they all had a great time interacting with the kids. Today I did the clinic by myself and saw two more good patients for the JH team. One is a 6 y/o with bilateral tibial hemimelia (the shin bone, or tibia, doesn’t form properly and in some cases can be mostly missing). She scoots around in the sitting position. I offered her surgery to allow her to stand and walk and be as tall as her friends and she is eager. Bilateral AKAs (above knee amputations) and prostheses will make her a happy girl. A five y/o with untreated clubfoot also came in. A displaced femoral neck fracture, nasty diabetic foot and 3 day old unstable pelvic fracture all came in within 2 hrs yesterday. The coming week with no one to help me and only spotty local anesthesia help will present some challenges. Maxi is a man who was transferred here from 8 hours away with a fractured hip and femur on one side and an open fractured tibia on the other side. The transfer occurred two months after his injury. This fractured tibia was still exposed with open dead looking bone. I stabilized everything and fixed his hip and femur shortly after he arrived a couple of weeks ago. The tibia has been the big challenge. I had asked Pat specifically to help me with this patient. Pat does soft tissue flaps to cover exposed bone. We decided to shorten his tibia to eliminate the dead bone then Pat did a nice fascial-cutaneous flap from anterolateral. We put STSG (split thickness skin graft) on the donor site. I learned something good from Pat on that case that might be of help here in the future with these open fractures. I certainly hope and pray that this will allow him to heal. A nice bone transport could eventually restore his length. I did the BK (below knee amputation) on the diabetic who came in yesterday and finished about 11 pm. Two 12 hour days, two 14 hours days and one 16 hour day made for a tiring week. I plan to put in a femoral traction pin to bring down the hemipelvis on the guy with the S-I (sacro-iliac– where the spine meets the pelvis in the lower back) dislocation. He also has a wide symphisis fracture- separation. The superior ramus is quite comminuted so I won’t be able to do an ORIF. My game plan is to put perc cannulated scres across the S-I joint if I can reduce it closed supine then pelvic exfix for the symphysis. If not, then open red and cannulated screws of S-I prone. Then second stage exfix supine for the symphysis. It will depend on the availability of blood too. I sure wish I had some more help these next two weeks to help with the work load and especially the challenging cases. We have a big problem with our large cannulated screw set. Our current set is a mixture of screws that require three different cannulated screwdrivers. We are looking into the possibility of using screws and other orthopedic implants from a company in India. If the quality of the product from the company in India is good, we could get a full set with 20 or 30 backup replacement screws of every size. That would give us inventory for a couple of years before needing to restock. At ten cents on the dollar compared to Synthes, the price is certainly right if the quality is there. They also have a proximal femoral nail system that bears looking into. We could flesh out our implant options and at the same time solve our resupply issues for our entire implant inventory. That would be an invaluable contribution to this program. Now the energy saga! Randy and Sammy changed out the radiator last Sunday and were unable to restart the generator. That left us with one smaller unit with its own overheating problems. Haiti Power gave us more than usual during the week which helped, but the remaining unit pooped out on Thursday-THREE dead generators! Randy found a small generator to continue charging the batteries for the invertor so we could continue to work. I did several arthroscopies with no AC and a SIGN nail exchange with lead apron and no AC. You should have seen the sweat I wrung out of my scrubs after the case. My little pocket notebook is still drying out. Administration quickly made arrangements for a rental deisel generator that came Thursday late afternoon. It took Randy and Sammy all day yesterday to get it hooked up. It runs 24/7 and purrs like a kitten. It makes hardly any exhaust. It is a Caterpillar. Randy told me they can be bought brand new for 34k. How I wish I had a couple of hundred k just sitting around looking for a good use. The plan is to put a strong effort into getting our generators repaired and working. The rental costs $200 daily. The Yoon team left today. It has been great to work with them. They are hardworking and very good at what they do. I appreciate so much their dedication to this project and the people of Haiti. Pat told me they are planning to come down again in September. Tom Slater has a knee that bothers him a lot. He has advanced medial compartment DJD. He had an ACL reconstruction nearly 20 years ago. I talked to him about my experience with Oxford unicompartmental replacements in patients without a normal ACL. He is very interested. I didn’t give him encouragement, only told him of the options. I think it is a reasonable procedure in a person his age with a normal lateral compartment. I emphasized that there are no long term studies to give us statistics on the likelihood of long term good results ij knees like his. I also encouraged him to make an appointment with Dr Keith Behrend in Ohio and discuss it with him. I made rounds and everyone seems to be doing reasonably well. I had hoped to put in the femoral traction pin on the patient with the pelvic fracture but there were no translators here today. I’ll do it tomorrow. I got a lot of rest today and am thankful for that. I am so thankful for the Sabbath. The surgery schedule was overbooked today and not by choice. Dr Spendey gave us the go ahead to do the amputation on the man with the completely avascular, foul smelling foot. The elective cases included hardware removal, clubfoot surgery, wound vac changes/debridements, removal of a wrist mass and extensive quadricepsplasty. Ed and I with the whole team working aggressively were able to get all of the cases done by late in the evening. Unfortunately, at 5 pm the powerhouse people notified us that they would be turning off the power immediately. No amount of reason prevailed. In spite of Madame Clotaire being notified of the situation, the power went off. The cases that had already been prepared for me proceeded. By the time I finished, my scrubs were totally soaked with sweat. I hope and pray that the wound will not get infected. The power returned after the case was over. Fortunately, it stayed on for the quadricepsplasty which took over two hours. Another 15 hour work day left all of us ready to get some well deserved rest. It turned into a light day today. Ed started in the OR with a couple of smaller cases while I did the clinic. Our big cases cancelled. It was a real disappointment for both Ed and me. It was the bilateral Blounts for TSFs. We were both looking forward to that case as the highlight of the week because of Ed’s special interest in external fixators. The patient decided to wait until next month so she wouldn’t have to miss any school. I hope Ed can come back and do the case with me then. Ed has really caught the vision of what is happening here at HAH and what the future can hold especially if we can effectively establish strong networks and partnerships. He told me of an exciting idea. He is good friends with Dr David Moorhead who is involved in a high leadership position at Florida Hospital. They have a children’s hospital together with Disney and are intent on attracting patients from around the world. The advanced orthopedics that is done here especially with children is an area that could be very beneficial for their program. He is planning to approach Dr Moorhead with the idea of a relationship that could be mutually beneficial. Having a sister institution with the Disney name attached could be very helpful for HAH. He is planning to invite Dr Moorhead to join him here at HAH for a site visit. What is being done here on an everyday basis has to be seen to be believed. I also had a chance encounter with Dr Archer in the hall yesterday. He asked about the coffee table book and if he could still make a contribution. I told him I was sorry but that the book had just gone to the printer and it was too late by a couple of days. Since he is quite politically connected, it occurred to me to ask if he had any relationship with the president elect. He said that he does and would be meeting with Mr Martelly that very evening. I asked if there was any chance that he might be able to inform Mr Martelly of the remarkable things that are being done here at HAH. His awareness of the excellent work being done here could help especially if he could give our fundraising efforts more exposure especially in the national media in the US. Dr Archer said he would talk to the president about that. It would be wonderful if the book could get exposure on a program like Oprah. I can only dream. I asked Tim to send me some proofs as well as the electronic version of the book so that we can use them to show anyone interested the high quality of the product. Ed and I needed to take the patient with the open tibial fracture back to the OR for a vac change. We decided to skin graft the fairly large granulated area. There is still bone exposed and left us with a challenge of how to get it covered. Dr Pat Yoon will be able to help us deal with that problem. He arrived today with his team from Minnesota. He is a trauma orthopedist and has been here twice before. We will take the patient back to the OR on Monday and reassess his status. 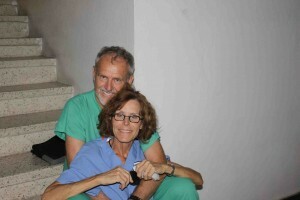 Once again, a special thanks to Amistad International and their teaming up with our doctors on the ground! Thank you for visiting our website. This blog will feature ongoing information from doctors and our team on the ground. Special thanks to DreamCo Design, our web design company, and the Amistad International Haiti Indigent Fund. Thanks Again.